What Are the Advantages of a Carry On Backpack? What’s the Best Way to Use a Carry On Backpack? 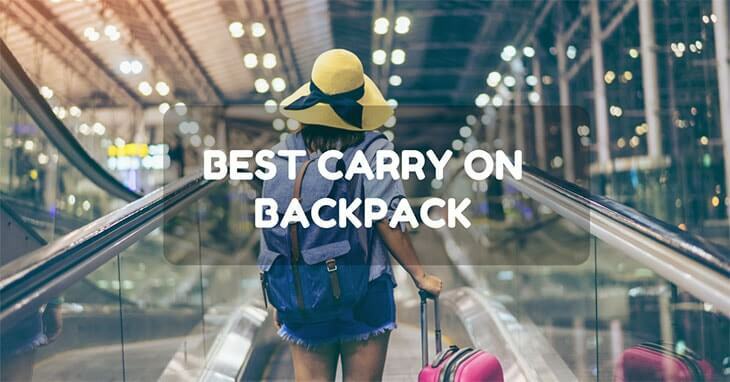 A good place to start when you are trying to find the best carry on travel backpack for you is to set yourself a budget. Obviously, the best quality materials and brand names cost the most amount of money but there are some equally brilliant mid-budget options too! As for the super-scrimpy options there are plenty available too; if you’re willing to compromise on some of the high-tech (arguably unnecessary) features you can find a good travel backpack for next to nothing too! The next thing to think about is capacity. How long are you travelling for? Do you want to pack light or bring everything, including the kitchen sink and more?! In general a 60-70L backpack will suit most travelling circumstances. If travelling long term you will naturally be more thrifty with your packing but need more ‘stuff’ to see you through the duration. If you’re going on holiday then you’ll want to pack an outfit for every occasion and as such 60L or 70L can fill up very quickly. Travel backpacks are far more advantageous than your classic, traditional suitcase. Although rocking up at an airport or swanky hotel with matching designer luggage may look cool in the movies it is far from practical when travelling in reality. A travel backpack makes you somewhat of a hermit. Not that you shy away when stress but rather you physically carry everything you need with you wherever you go! When you’re travelling long term it does start to feel like your pack is your home, your life in fact! Travel backpacks are lighter and more durable than suitcases. The lighter the better when travelling, trust us! With airlines charging through the nose for overweight baggage you want a bag that is as light as possible to maximise your packing potential. Durability is a big factor too! Your bag, however hard you try, will get through all around and up and down, experience different temperatures and be stored, at times, in questionable places. You want a bag that will last the duration of your trip and more…many more trips in fact! Like we said, durability is a big factor. What is the bag made of? Many bags now come in a special slash-proof material meaning that your belongings will be safe should someone try to slash your bag with a knife; a common ploy by petty thieves across the world. Durability doesn’t just apply to the bag’s material but the zips too! Sturdy zips are an absolute essential. On cheap and cheerful bags you can be guaranteed that the first thing to fail is the zips and thus renders the bag obsolete. Comfy straps are another key factor in choosing your travel backpack. If you’re going to be lugging your bag for miles at a time, or even if you’re not, comfy straps make life so much easier! Other factors to consider are external straps for tying on boots and camping gear and tech slots for your laptop, tablet and smartphone. Why, on the road of course! And by on the road we mean travelling! Use your travel backpack to carry your precious belongings through airports and train stations, at festivals and when heading home again. The best way to use your travel backpack is with the straps adjusted to fit your body. The hip band clipped around your waist and again adjusted to a comfy fit and if you’re carrying a very heavy load clip the thinner chest strap across too. If you’re short on space when you’re back at home use it to store all of your keepsakes that you don’t need to have on show! Is There Anything Controversial About Using a Carry On Backpack? Not that we can think of! For some people to travel using a backpack when not technically a ‘backpacker’ may seem a little odd but apart from those who hold that opinion there is nothing stopping you chucking your pack on your back and hitting the road! As we mentioned above, checking that the backpack has comfy straps is the first prerequisite to consider. Secondly, does the bag come with a warranty? Some companies offer a warranty as an added extra. It's worth checking whether your travel insurance covers bag breakage before you get yourself unnecessarily double covered! The Osprey Farpoint 40 Travel Backpack is a 40L travel backpack constructed using strong and durable nylon material. The Osprey Farpoint 40 Travel Backpack is genuinely unisex for the black design is stylish and limitless. This bag is perfect for a short to mid-term traveller offering all the space that you may need and a little more via the external straps that can be used to add hiking boots or a yoga mat perhaps. The Osprey Farpoint 40 Travel Backpack has ultra comfortable straps and many people have exclaimed how they would gladly carry this bag for hours at a time. The bag comes in two sizes, small/medium and medium/large. This refers to strap lengths not the capacity. Both sizes still offer a 40L internal capacity. The Osprey Farpoint 40 Travel Backpack is great in that it has a specially designed laptop compartment to keep your precious computer safe. The design, however, is a little questionable with the long, thin, pocket compartment being on the outside of the bag leading to uneven weight distribution. This is fine for short carries but if carrying the Osprey Farpoint 40 Travel Backpack for longer durations this may become troublesome. Straps can be zipped away within the bag and concealed. Concealed laptop slot creates uneven weight distribution when carrying a laptop computer. The Kelty Redwing 44 Backpack comes in two great colours; black and safari-tan. These colour options are just the tip of the iceberg when it comes to what the Kelty Redwing 44 Backpack has to offer us! The Kelty Redwing 44 Backpack is suitable for travel of all kinds. Whether you’re packing light for a long-term travel adventure through every possible terrian, just nipping across the pond for a business meeting or taking a snappy city break next weekend then the Kelty Redwing 44 Backpack is the versatile bag that you have been looking for. The backpack has a U-shaped zipper that makes for even easier access into the bag and as we’re sure you know, Kelty don’t do light when it comes to using durable materials. You can rest assured that the zippers on the Kelty Redwing 44 Backpack are as study as can be! The bag has external loops for strapping on your hiking boots and camping gear should you pack a little over-zealously! The Kelty Redwing 44 Backpack as the name suggests has a 44L capacity which makes it a wonderful midsize bag. It has been said that that the straps on the Kelty Redwing 44 Backpack can be a little uncomfortable at times which is something to bare in mind! Straps uncomfortable if not adjusted correctly. The North Face Jester Backpack is North Face’s answer to the Osprey Farpoint 40 Travel Backpack. Is made of polyester which, although not 100% water-proof will withstand a heavy shower! Perfect for travelling through Europe in the summer but maybe not Asia during the monsoon months. The North Face Jester Backpack features velcro pockets for extra security as well as additional secure zippered pocked too. The bag has everything you can think of covered, it even has pen pockets! The North Face Jester Backpack has a 360 degree reflective bike-light loop for those who will wear the bag while cycling as well as tabs for your water bottle too! The straps on the North Face Jester Backpack are really very comfortable and feature webbing along the shoulder straps for improved heat dissipation. The final feature on the North Face Jester Backpack is the elastic bungee cord on the front of the bag which assists you when you need to carry items externally; anything from your laundry to a football in a net! The North Face Jester Backpack is smaller than its competitors, so is not suitable for long or even mid-term travel. Quite small, can only carry a laptop and a few books. The Timbuk2 Uptown Travel Backpack is a nifty little backpack made by the little known manufacturer Timbuk2. The Timbuk2 Uptown Travel Backpack has been designed for those who wish to have a long lasting back for the commute to work but that is versatile enough to be taken on flights for quick business trips abroad. One major positive of the Timbuk2 Uptown Travel Backpack is that it complies with TSA rules meaning that you do not have to remove your laptop or tablet when going through the airport security scanners. This can save you precious seconds if you’re running late for your flight! The Timbuk2 Uptown Travel Backpack has plenty of little hideaways and hidden pockets to store all your essential items, not just your passport and laptop! The Timbuk2 Uptown Travel Backpack is a perfect carry-on companion as it is only 30L in size so equates to about two thirds of full length allowed per person per flight. If you’re a really savvy and thrifty traveller you could use the Timbuk2 Uptown Travel Backpack for long term travel but in reality you would end up feeling frustrated by its small stature after a month or two! The Timbuk2 Uptown Travel Backpack has a really fashionable design. Rather than a plain polyester black the Timbuk2 Uptown Travel Backpack is grey with hints of green and tan to make it appear a versatile in appearance as it is in practicality! One downside to the Timbuk2 Uptown Travel Backpack is that it falls when placed up right on the ground so remember to always lie it down when not wearing it! Falls when left to stand alone. The Sumtree 35L Ultra Lightweight Foldable Packable Backpack, Durable Hiking Daypack does what it says on the tin! Let’s call it the Sumtree 35L Ultra for short! The Sumtree 35L Ultra comes in so many different colours! The Sumtree 35L Ultra is ultra bright as well as ultra light! The Sumtree 35L Ultra is made of a super durable material and is waterproof meaning whatever the weather the Sumtree 35L Ultra will be there for you! Your new best friend! The Sumtree 35L Ultra is as we’re sure you’ve realised has a 35L capacity making it the perfect bag for short to mid term trips. The Sumtree 35L Ultra folds away meaning you can pack it down within a bigger bag should you anticipate requiring extra room on you return. Although not the biggest capacity bag on the market the Timbuk2 Uptown Travel Backpack has the best overall ratings and is great for short term travel. The Timbuk2 Uptown Travel Backpack incorporates all the key factors were discussed in the ‘what to look for in a travel backpack’ section. Whatever carry on backpack you choose, make sure you travel happy!